This beautifully decorated 3rd floor 2 bedroom, 2 bath unit sleeps 6. Rooms Sleeps 6, This beautifully decorated 3rd floor 2 bedroom, 2 bath unit sleeps 6. Enjoy the gulf view from your private balcony! The unit was a little smaller that in past years. The mattress in the master bedroom needs replaced. But overall Love the location. We have been coming for the last 6 years. Let me start by saying, this was the cleanest condo I have ever stayed in!! Decorated very nice, super comfy bed, amazing pools... it really was paradise!! Unfortunately, we stayed when Hurricane Gordon decided to hit. We got a couple of good days on the beach and then decided to head out. The condo manager very graciously refunded us for the rest of our stay and I’m already planning to come back next year! LOVE Dauphin Island and THE INN!!!! Prettiest condo we have stayed by far! Clean, fresh decor! Had everything we needed and then some. It truly felt like "home" and we felt so very lucky. Even the front desk said "Ohhhh, you are in 310? Thats one of the best ones we have!" Really enjoyed my stay the room was clean and the staff friendly just wish it was closer to the beach. Enjoyed the concert on the beach. I will go back. This was a wonderful experience. We would come back again! This was our 2nd year and we loved it! Nice beaches, quiet family friendly. We will be back! The Inn at Dauphin Island is our go to spot for vacation. This unit (310) specifically does not need anything! It’s perfect. Super comfortable and well maintained with an amazing view of the gulf. We really enjoyed our stay in this unit for many reasons but most of all, because of the view and comfort. I would highly recommend The Inn and unit 310 to anyone wanting to relax with the sounds of the beach and the two pools on property. Well done again! 13 years in a row and many more to come. We enjoyed our week on the island. The island is peaceful and removed from spring break craziness. I would recommend that all condos be equipped with a beach wagon as it is a ling haul with kids and everything they need. Otherwise the condo was great! We had a very nice time at Daylphin Island for Christmas! Our condo was clean, comfortable, and convenient to other things on the island. We hope to someday return. What a fun time we spent in Dauphin Island with our best friends of almost 40 years. Finally we were able to get a time when the four of us retirees could spend a week doing whatever we decided to do. We enjoyed some surf fishing, a day trip to Biloxi, an evening in Mobile for dinner a the haunted Duck Tour, and just exploring the island. We fell in love with Skinners, Captain Snappers, and The Lighthouse Bakery. Our only disappointment was that we could not go to the west end of the island to watch the sunsets. We did, however, find a great view from the golf club to enjoy the sunset one evening. Enjoyed the stay. Wish the owner would upgrade TV in bedroom to a little larger size but otherwise a comfortable place. My wife and I loved our stay. Staff was welcoming and our condo was perfect. It had all the utensils, dishes and pots we needed for everything. Very clean and wonderful view. This was our second time to the island and would return tomorrow if we could. Had an amazing time. Perfect for our family of 4. Would definitely stay again. Perfect place for a weekend retreat. Accommodations were above expectations, staff was friendly, and just enjoyed a nice weekend with the grandkids. Everyone was so friendly, our condo was clean and felt like a home away from home. We plan to make this an annual trip! See you there. Love The Inn at Dauphin Island! We had a wonderful, relaxing vacation, and would return!! STAFF was very professional and helpful. We loved our stay. the condo was nice and clean, well furnished, good views, and two pools, the wife liked that. The only negatives were the long walk to the beach and looking at the off shore wells.I guess you don't notice them after a while. Over all I loved our vacation. Dauphin Island is Alabama's best kept secret! Loved our stay on the island. It was very low key, perfect place to unwind and relax. Had a wonderful time on dauphin island. the accommodations were excellent. The 3rd floor condo had everything we needed. The décor was beautiful. Can't wait to come back. What a beautiful place! This condo and this island are the perfect getaway. Great place to create and recreate memories! We stayed at The inn room 310 this past week. We had booked a stay in Sanibel but were afraid to go with the algae in the water. I had heard about Dauphin island being just as peaceful & much closer to TN. We found this room available. Our stay was amazing. The room was super clean. We loved having a washer & dryer. We left with all clean clothes except what we had on (no work when we got home). The unit had all things we needed to cook. Beach was close. Pools were clean. Staff was super nice. Will go back. Beach was clean, updated pool furniture and pools kept clean daily..and we were able to stay Saturday night, 7 nights!!! It was fantastic! The condo was great! Needs more pans and baking dishes and only has one small cutting board, please update kitchen! Patio furniture was great for 4 people! Needs another lounge chair in sitting room. Having a vacuum was wonderful, very helpful to remove sand over a week with 4 people! Fridge with working ice maker saved a lot of hassle from previous stays-fabulous! It was very relaxing and awesome. Will definitely by back hopefully next year or sooner. The condo was great. This Beachey paradise just what we needed! This place is a must to put on your bucket list. If your looking for relaxing, with everything you need this is it. Just when you think it can't get any better you receive a warm and friendly feeling from all shops on the island. "Away from the Maddening Crowd"
Peace and quiet with outstanding views. Check in was a breeze and having a hotel type cart to take our food and clothes upstairs to 3rd floor by elevator was an unexpected treat. Staff was excellent and always accommodating. Our. Unit was very nice, clean and comfortable. The only thing we didn't like is the noice from the ac unit during the night. Our bed was on the same side of the wall. When the ac unit kicked on it would wake me from a sound sleep. Otherwise we loved our stay. The room was clean and neat. The view was pleasant and the staff, at the front, was very helpful. The canopy between the two pools needed replaced. The boardwalk from the condo pool area to the beach should be extended to approximately double the current length. The trek through the sand is excessive. The unit next door, The Beach Club, does not have a boardwalk and we would not rent a condo in that complex until a boardwalk is built. 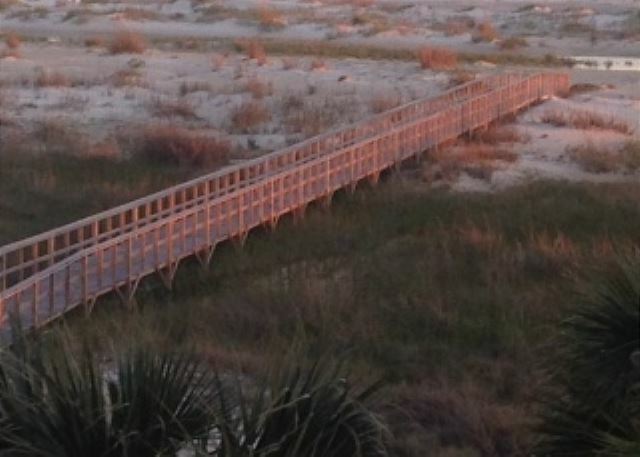 We have rented units in both The Inn and The Beach Club and a boardwalk is essential. Overall our stay at 310 The Inn was acceptable. Super. Great condo. Nice location. Total relaxation. Great getaway from winter weather, although weather can be as changeable as any location. Lots of fog this season, but pleasant temperatures. Views are beautiful and staff is always helpful. We were given a vacation package to your condos by our son. We were making plans for our trip, when we came down with the flu. Your staff worked with us, so that our son would not lose his money and we could make the trip. We were able to reschedule our vacation which we enjoyed very much. We are planning to visit again and this time we are bringing our whole family. It was very easy to make a reservation. We paid the balance of our unit over the phone on the way down since we were arriving after hours on the Wednesday before Thanksgiving Day. The unit was very roomy and clean. That evening was a bit cool and when we tried to turn on the heat to break the chill, the unit would not come on. We called the answering service early the next morning (Thanksgiving) and within 30 minutes, someone was there to fix a loose connection in the thermostat. The views from the balcony allowed us to see the sunrises and sunsets while we were there. From the front door, you can also see the Dauphin Island bridge. We definitely want to return to The Inn at Dauphin Island because this unit was perfect! This property was as described minus the note that at this time of year you can watch the sunrise AND sunset all from the balcony! The property, inside and out, was well maintained, clean, and full of amenities. The beach as a further walk from the pool than we'd imagined but beautiful. The island is quiet, calm, and the people are so friendly. You must visit the visitors center to speak with a local! Best friends for over 50 years, we grew up in Mobile and Dauphin Island was a natural part of that. We decided to take a couple of days and just look around the place that held so many memories! We brought no men or children and ate and drank only what we wanted when we wanted!! So much fun and I'm sure we'll do it again! Condo was nice and clean. View was great. Only one complaint would be the curtains in the living room were only sheer, not room darkening at all for our son that slept on the pull out sofa. Otherwise, we were very pleased! The staff was helpful and friendly, especially Lisa at the front desk! We enjoyed our visit to the island, a laid back beach experience. The crowds are light and there are no high rise condos, or loud beach bars. It is a wonderful place to enjoy the beach and nature with your family. The condo is spacious and decorated nicely and also very quite....which is what we were hoping for. I would definitely bring my family back to stay here again!!! We have stayed there twice both times were great. We really like how quiet it is.